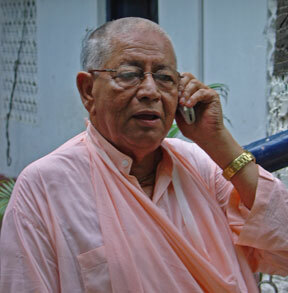 Srila Govinda Maharaj began with Das Goswami's prayer to Swarup Damodar Goswami and continued going deeper and deeper into the conception and gift of Srila Sridhar Maharaj. What has our guru given us? He has given us everything, starting with the divine name of Sri Krishna, which takes us ultimately to the service of Sri Sri Radha Madhava. Then there is the negative side as expressed by Srila Das Goswami. This is extreme expression of the devotional mood. If I will not get the mercy of Sri Radha (personified by Srila Guru Maharaj), then I have no position anywhere. Even Braja Dham and Sri Krishna himself will not be for me if I am without her mercy. Srila Kaviraj Goswami has also expressed the negativity of his heart, but he has to confess that by the grace of Sri Nityananda Prabhu, he has received everything. The opulence of the Sri Chaitanya Saraswat Math was so vast, but really it was all contained in one place, that was the personality of Srila Sridhar Maharaj. He embodied all the wealth of the Math, which was the treasure of the Rupanuga Sampradaya. All of the exalted godbrothers of Srila Sridhar Maharaj came to visit him and extract some of that divine wealth. 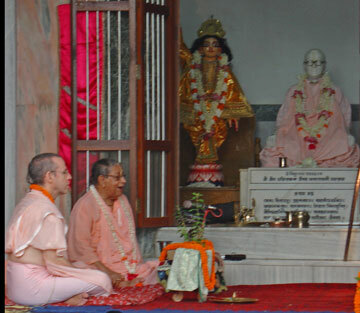 They were all great Vaishnavas themselves and all vastly learned in the Vaishnava scriptures, but they came to Srila Sridhar Maharaj because he was the rudder of the Rupanuga Sampradaya and this was given to him by Srila Saraswati Thakur when he asked Srila Sridhar Maharaj to sing Sri Rupa Manjari Pada just before his departure from this world. All present saw it as a divine power transmission. Srila Guru Maharaj saw some energy in me and he utilized that energy to spread the glories of Sriman Mahaprabhu and the mercy of Sri Nityananda Prabhu and their parshad devotees all over the world. When I joined the Math, I had some culture from my birth, but that was sahajiya vaishnava and the followers of Srila Saraswati Thakur were dead set against the conception of sahajiyaism. Just as a music instructor will charge double for students with previous musical experience, Srila Guru Maharaj asked me to forget everything of my previous experience and I tried heart and soul to do that. 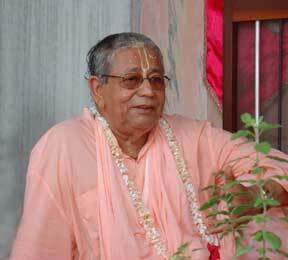 Gradually, the glories of the Sri Chaitanya Saraswat Math have spread all over the world. In Russia, America, South America, Europe, Africa, Australia and very amazingly, by one man, Sripad Yudhamanyu Prabhu, our Mission is now established in China. 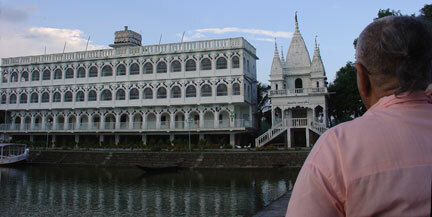 A special place for Srila Guru Maharaj was London because Saraswati Thakur was thinking about sending Srila Guru Maharaj there, but he could not go at that time. 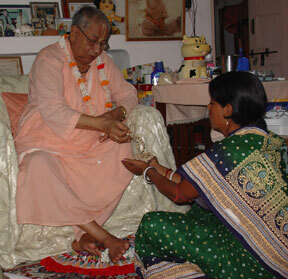 Finally, the people of London came to him and the London Math was considered by Srila Guru Maharaj to be his Math. We have come far from the days of "der paisa muri" (a penny's worth of puffed rice) but the conception and the source of everything has always been Srila Guru Maharaj. 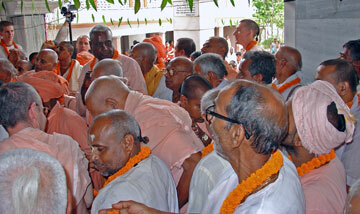 The Western devotees came and were eager for the conception of Srila Guru Maharaj. Sripad Bhakti Sudhir Goswami Maharaj collected so much of Srila Guru Maharaj's divine instructions and turned them into beautiful books. First was Search for Sri Krishna, then came Sri Guru and His Grace, then Golden Volcano of Divine Love, Loving Search for The Lost Servant and Subjective Evolution of Consciousness. 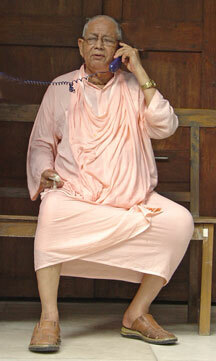 Srila Guru Maharaj's deepest realizations were recorded. When I heard Srila Guru Maharaj explaining the Gayatri mantram to the Western devotees, I asked him, "Why are you explaining this to them?" He replied, "If I do not give this, who in this world will give it." Then I was extremely happy to see that the treasure of Srila Guru Maharaj was being stored and distributed. When Sripad Yajavar Maharaj was sent by Saraswati Thakur to manage the Math at Kasi, he wrote a letter to Saraswati Thakur and requested him, "If you will please send Sripad Sridhar Maharaj to this Math, then your conception will be firmly and perfectecly established. This city is filled with Mayavadis and various other persons with conceptions opposed to the bhakti-marg, but no erroneous conception will be established in the presence of Sripad Sridhar Maharaj." To spread the holy name around!" "The sad-guru is always satisfying the Lord by offering a variety of tasteful foods. He is then eager to satisfy the devotees with those divine remnants." This evening, this recipe came directly from the lotus mouth of our dear Srila Gurudev, "For a few days I have been thinking I would like to cook something for the devotees, but I am not getting the chance." He then described what he would like to cook. First toast some mung dahl then add very little tumeric, salt, sugar and fried cumin (powdered after frying). Add a little water to make a very thick dahl. If the dahl becomes too thin, you can add a pinch of wheat flour to thicken it. When this is done, prepare some coconut sandesh or other type of curd preparation of your choice, coat it in the thick dahl and fry it. 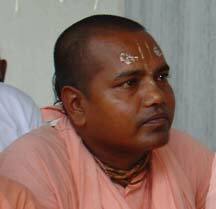 "Sanatan Goswami wrote Hari Bhakti Vilas, a very big book. All of the rules and regulations of that book are impossible to be followed by any person in this world. Still he gave us some hope, an ahaituki-bhakta is beyond all these things. We have not completely read the book,but as necessary, we have consulted it. There we find the ruling for festival dates, we will follow the system followed in Jagannath Puri. Similarly, the cooking for Govardhan Puja will be done during the pratipad and must be offered not more than four hours after the pratipad. Mahaprabhu very strictly followed all social rules and he did not try to break them. But when it came to distributing Krishna-nam, Mahaprabhu had no rules or regulations. 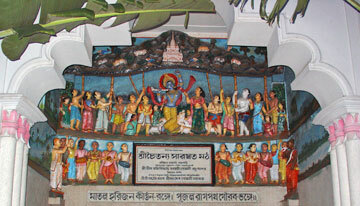 His real followers, headed by the Six Goswamis and Haridas Thakur perfectly followed Mahaprabhu's example." Srila Gurudev instructs the managers of the Math about the principles of the Math, who will stay in the Math and who will not. As with everything, he emphasizes the principle of giving honor to others. "The Math must be protected. 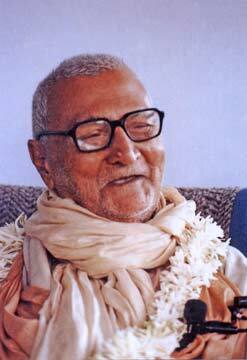 When I was in better health, I was ready to remove all disturbances from Srila Guru Maharaj's Math. When I would pass them on the road, those who were blocked from causing disturbances may have insulted me from behind, but never to my face. I promised Srila Guru Maharaj that I would look after this Math and I am always ready to do anything to accomplish that. When a Western devotee's toilet was clogged, I unclogged it with my own hand. There is no service in this Math that is not Divine and I am eager to serve. Still, I will do so with a pleasing mood. Satyam bruyat priyam bruyat. " 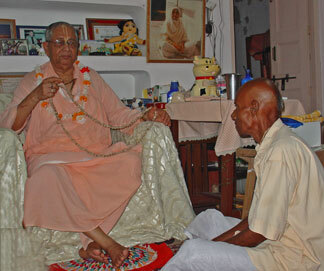 Srila Govinda Maharaj's mood of service is not something faded with age or ill health. We have heard that real devotion cannot be checked by anything material, but such devotion is very rare. 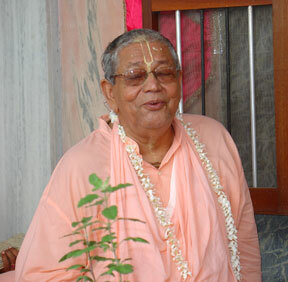 Srila Govinda Maharaj's advanced age nor ill health has been able to stop his service. Recently, he completed his 22nd world tour and back in Nabadwip Dham, he is always at the beck and call of divine service. Before even reaching the bottom of his stairs, he is engaged in managing the World Wide Mission of over 50 Centers and he may take a break from the sudden downpour of monsoon rain, but there is never a break from service. Today Srila Govinda Maharaj welcomed some sincere seekers and very pious seekers from Sri Bahmanpara Dham into the family of the Sri Chaitanya Saraswat Math. He planted the seed of divine love in their hearts and transmitted the divine sound into their ears. Sanctifying their tulasi-mala, he beseeched them to take the name of Krishna without offense. By chanting the pure name of Krishna, we will cut the knot binding us to the mundane plane of exploitation and attain shelter at the lotus feet of Sri Krishna. Of all the methods of devotion, nam-sankirtan (chanting the name of Krishna)is the best. If we will do this without offense, we will get the priceless treasure of divine love. "There are so many engagements in this world, but the only engagment we need is through devotion. 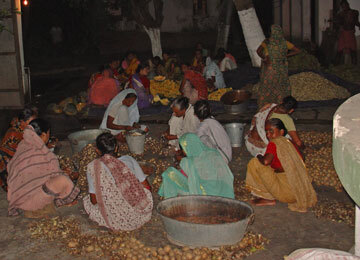 If we serve the devotees, the Lord will be pleased with us and this process is simple and natural. Each day we must chant 16 rounds of Krishna-nam, but if the pressure of our service may cause us to miss our target, we must not chant less than four rounds. So serve the devotees, the Deities and the Math. It is very easy and very natural." What Srila Sridhar Maharaj conceived and Srila Govinda Maharaj drew the plans for, Sripad Acharya Maharaj executed with lightening speed. Srila Govinda Maharaj had to stop on his "scooter" tour of the Math and admire the beauty of Sri Govinda Kunda.